Less is more as Ocean’s 8 continues a quality series thanks to expert filmmaking and a stellar cast. Sandra Bullock plays Debbie Ocean, expert con artist and estranged sister of Danny Ocean, played by George Clooney in Steven Soderbergh’s previous Ocean’s film trilogy, which was inspired by the 1960 Ocean’s 11 movie starring the “Brat Pack”. Gary Ross (Pleasantville, Seabiscuit) directs and writes the story for this worthy spinoff plus he co-writes the screenplay with filmmaker Olivia Milch (Dude and the upcoming Barbie). Soderbergh served as second-unit director on the District 11 riot scenes for Ross’ 2012 film The Hunger Games, so the film crew collaboration matches well here. Soderbergh serves as a co-producer on this film. After an initial parole hearing sequence, filmmakers set the tone for the New York City urban area where everyone seems to know each other and The Met gala provides the focal point for a jewelry robbery. This character familiarity diminishes some potential tension and unpredictability, but keeps the focus on the protagonists and main action at a nice, even pace. Ross’ impressive high angle shots and multiple split screen montages enhance the visual appeal. The cinematography from Eigil Bryld (In Bruges, Becoming Jane, House of Cards) highlight the lowlights in the urban settings while expert casting from mainstay Debra Zane (The Hunger Games, Dreamgirls, Traffic) raises the audience appeal. Bullock shines as Debbie, a street-smart leader who confidently uses her skills and carefully relies on her partners/peers. “Do you want me to tell you how big a job it is?” she asks a potential recruit and she and Lou, played by the ageless Cate Blanchett, make the rounds to form a small, formidable team. Bullock even get to converse in German with Heidi Klum…then continues for some great comedic moments that are also very functional to the 110-minute plot. Blanchett as restaurateur Lou, Debbie’s right-hand woman, provides valuable advice like “Do not run a job in a job” while keeping Debbie accountable when necessary. “Why is there always an asterisk?’ she says to Debbie. Debbie rouses the crew with lines like “let’s do it for all the 8-year-old girls dreaming of being criminals.” She’s cynical, but sensible as she expertly negotiates through a familiar world. Bullock flexes her comedic muscles well without resorting to slapstick or goofiness. Her character’s references and actions relating to her brother Danny will likely make audiences crave a combined character sequel or maybe even a family prequel. Sarah Paulson plays Tammy, Debbie’s former partner, current suburban mom and a resourceful “fence.” More background between Tammy and Debbie would have been great, but audience’s do get a flashback sequence with Lou and Debbie, which also incorporates an important association with art curator Claude Becker played by Richard Armitage (The Hobbit film series). Mindy Kaling play Amita, an expert jewelry maker while rapper/TV personality/actress Awkwafina (a.k.a. Nora Lum) plays a street-smart thief named Constance. It’s a star making role for this Korean phenom who also stars in Crazy Rich Asians later this year. Rihanna plays a tech genius named Eight Ball who covers the technological shortcomings of the men in the previous Ocean’s film trilogy (“You’re analog players in a digital world”). Helena Bonham Carter plays a struggling fashion designer Rose Weil who has access to starlet Daphne Kluger, played by Anne Hathaway, who gets to flex her comedic muscles in a great role. Rose’s profession provides a nice default for eccentric behavior, which plays a key role in making this impressive heist possible. James Corden plays John Frazier, an insurance specialist while Dakota Fanning has a small, but important role as Penelope Stern. Materialism becomes the characters’ prizes as they conquer considerable challenges with no single villain or anatognist…even police officers are regulated to aftermath situations to help the audience fully delve into this escapade. This female crime crew does not even try to make the people they’re stealing from look bad as many in the crew yearn for additional personal financial freedoms, which Debbie wields to motivate them. 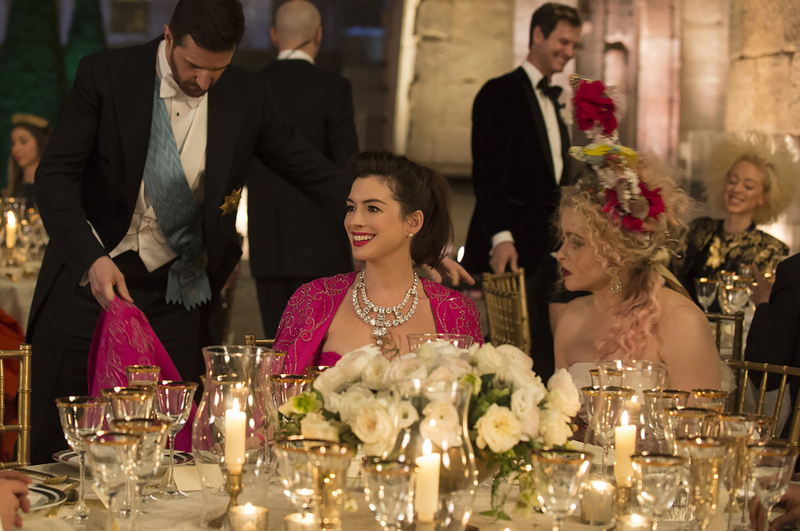 The key dialogue spoken by ringleader Debbie explains this crew’s approach and works when a heist crew wants to keep a low profile in their prep and ultimate “performance” of the intricate scam, but logistically these roles are switched at the gala. The men get ignored while everyone wants to know what the women are wearing. This switch raises the stakes a bit, but mainly gives each woman a chance to show their skills, which could even incorporate into a possible sequel. These women put themselves in dangerous situations, but the sophisticated, direct dialogue (“We use real names around here.”) keeps audiences focused on the challenging problem solving as several plausible twists and a few surprises help mold a very entertaining experience. Musical composer Daniel Permberton has been on a hot streak lately with score for Molly’s Game, Gold and Steve Jobs and keeps it going here with an eclectic, high energy score that matches the high style and high stakes. Songs like “These Boots are Made for Walking” by Nancy Sinatra and “Bossy” by Kelis also enhance the film. Look for nice cameo appearances from two male characters from the Ocean’s trilogy. No Julia Roberts, Catherine Zeta-Jones or Ellen Barkin here, but there are plenty of celebrity cameos including Katie Holmes, Alexander Wang, Anna Wintour and Serena Williams. Ocean’s 8 was released on the eleventh anniversary of the 2007 film Ocean’s Thirteen. Ocean’s 8 comes recommended (*** out of four stars) and is rated PG-13 for language, drug use, and some suggestive content. This entry was posted in 2010s Film Reviews, Film Reviews and tagged Debbie Ocean, Film, Michael Siebenaler, Mike Siebenaler, Ocean's 8, Sandra Bullock, Tall Writer. Bookmark the permalink.